Stowford Paper Mill with its iconic features has been part of the Ivybridge skyline for generations and is one of Devon’s oldest industrial sites. Records show that a corn mill existed on the site as far back as 1550. The first paper mill was established in 1787 by a Plymouth businessman, William Dunsterville, having purchased the Stowford Estate earlier. Dunsterville did not stay long because in 1796 Henry Rivers, an innkeeper by trade, purchased the whole of the Stowford Estate only to lease it to Francis Fincher the following year. Under his management the mill appeared to prosper with the manufacturing of paper entirely by hand. In 1837 the first paper making machine was installed which transformed paper production. However, it was in the mid-nineteenth century that the mill enjoyed a golden age, under the ownership of John Allen and subsequently his two sons, Edward and John. Between them they ran the mill for over sixty years and it is debatable that without their investment and enterprise, the paper mill would have survived the second half of the century. Under the name of John Allen & Sons, two new paper machines were installed and the site was rebuilt and extended. John Allen’s influence on Ivybridge extended beyond the paper mill. He funded the construction of the Methodist Church along with a row of 10 neighbouring houses in Fore Street, providing accommodation for his workforce. These are still known today as Allen’s Cottages. In 1910, following the death of Edward Allen, the paper mill was sold to a syndicate. The Clapperton family who already owned a paper mill in Oxfordshire, were prominent members, with Richard Clapperton serving as Managing Director. For the next 14 years they invested heavily in the mill, despite a major fire, the outbreak of WWI and the difficult trading conditions which followed. 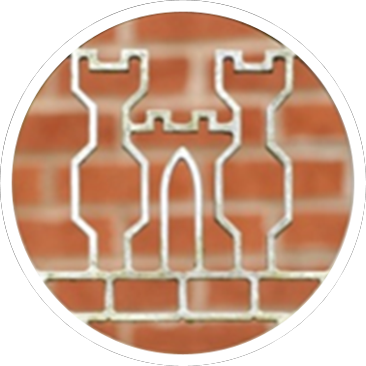 During the 1920s, under the management of Portals, the manufacturer of banknote paper for the Bank of England since 1724, security papers were first introduced to Stowford Paper Mill. This business sector remained an important part of the mill’s operations right up until the closure in 2013. By the 1930s Wiggins Teape had purchased Stowford Paper Mill and business continued to flourish. Developments in watermarking enabled even the smallest of enterprises to consider bespoke watermarked business stationery. The mill supplied many well-known companies and organisations with their own watermark. The South West Film and Television Archive (SWFTA), the regional film archive for the South West of England, holds a very interesting short film originally shown on Westward Television in 1962. 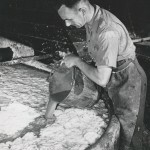 This film, entitled Stowford Paper Mill 1962, gives an insight to paper manufacturing from this time and can be viewed on BFI Player, which forms part of the British Film Institute’s National Archive. In 1991, Wiggins Teape merged with the French paper corporation Arjomari Prioux, a move designed to bring synergies between the two successful paper making groups through economies of scale. The mill once again re-focused on the security paper market. Whilst Arjomari had paper mills of their own in this specialist security paper field, the new security sales and marketing team of ArjoWiggins based in Paris, managed to allocate the business between the mills to the benefit of all. This last chapter in the history of the paper mill proved to be a very successful one and a lasting ‘entente cordiale‘ was established. 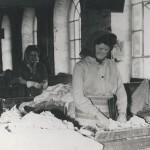 This section of the website which is dedicated to Stowford Paper Mill, provides a comprehensive archive of mill activities. 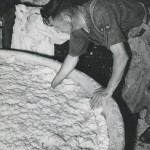 The use of rags and locally sourced china clay in paper making. The importance of watermarking to the business activities and product portfolio, the range of security papers manufactured, including documents we all have at home, through to the special projects which the mill participated in. It will provide information regarding the development of the paper mill, together with the people who managed and worked there and its interaction with the local community of Ivybridge. On the 21st November 2013, the very last reel of paper came off Paper Machine No.2, thus bringing paper manufacturing in Ivybridge to an end after 226 years. 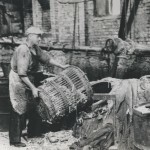 Owing to a decline in general business papers, mainly as a result of changes in communications technology, the mill’s owners, ArjoWiggins, took the decision to transfer the business to a larger paper mill located in Aberdeen, utilising its excess capacity and close Stowford Paper Mill. The last employees vacated the site in early 2014.